I’m excited to announce that I’ve joined Dropbox as their new Head of Security. Truth be told, I’ve been here a little while and I’ve been enjoying on-boarding too much to make the announcement. If you were wondering why my blog has been quiet for a while, now you know why! Scale and sensitivity of the data. Half a billion users storing sensitive files is a worthy stash to protect. The excellent caliber and decent size of the existing security team. Working with strong leaders and team members is a big draw. The assertion about the warmth of the people and culture deserves some supporting evidence. This is a little story from before I joined. As you may recall, I was researching server-side usage of ImageMagick and one of my discoveries affected Dropbox in a fairly minor way. The response was spectacular -- and warm, and competent. Of course, the foundations you expect from a solid security program were present: a public bug bounty program with a fast response time. Beyond that, upon submission of what was considered an interesting bug, I was…. invited up to Dropbox HQ for chai(! ), a snack, and a chat with Dev (@frgx) plus the author of the sandboxing for this area. What a great experience. It would be remiss of me to not mention that Dropbox is hiring for all types of security roles. The team is already a decent size, but we are growing. This job req is what you are looking for. On a social note, this move means that I’m now up in SF city a lot of the time. Hit me up if you want to grab a drink and talk about security. Google's Project Zero team was announced in July 2014. Since then, it has become very well known for publishing offensive security research of exceptional quality. This is especially welcome to defenders at a time where top quality offensive security research is drying up. For most important software targets, it's getting harder to find and exploit bugs. And for those individuals who remain in the pool of people still capable of playing this game, many have been attracted by positions that seek to abuse vulnerabilities rather than get them fixed. Are left alone to self-select research on whatever they deem important. Get to work alongside other top-tier researchers. Are expected to openly publish everything they discover. Are never given bounds or direction from management. Are supported by their organization when navigating the minefield of vulnerability disclosure. Are given good resources and top tier corporate pay. Google deserves a lot of props for hiring a decently sized team that broadly hits the above points. And there is nothing to stop a different company from doing the same. Has Qualys done the same? Since the inception of Project Zero, I've personally seen it as a team called Project Zero, that just happens to be generously funded by Google. Also, an umbrella term under which any team could operate if they adhere to the principles of openness and freedom of employed researchers. Qualys keeps pumping out research that I find surprisingly cool. Today, we had The Stack Clash, a great read, which finally tipped me over the edge to write this post. Previously, I had noted and enjoyed attacks against the OpenSSH client and a glibc resolver buffer overflow. Three strikes and you're out, perhaps? So Qualys clearly have one or more very talented hackers on the payroll. (We don't know who because the publications in question are not credited with individual names. I suspect some old-school hacker.) How does Qualys' observable behavior stack up against the list above? Left alone to self-select research: YES. Hard to imagine management saying "hey, how about you go find, like, 10+ CVEs across all the most popular UNIXes, covering crashing the stack into the heap, and don't forget about 64-bit?". Top-tier team: YES. This is defined by output. As one example, Stack Clash is top-tier output. The writing in that report uses "we", suggesting a top-tier team instead of a single top-tier individual. Lack of management direction: MAYBE. Hard to tell whether the Qualys Labs team is left alone to research 100% of the time, or if they are directed to take certain audits at certain times, or even contracted out. Some of the research targets are a bit weird, such as "Trend Micro Interscan Web Security Virtual Appliance" (link). This does not sound like a research target that a top-tier researcher would self-select. Organizational support for disclosure: MAYBE. We haven't yet seen if Qualys would be willing to stand up to a (e.g.) Microsoft or Apple trying to bully Qualys or one of their individual recruiters. There's also the worrying signal that Qualys unilaterally extended a disclosure embargo, going back on an agreement with Solar (see oss-sec post here). There's also the question of whether "customers" get access to details before patches are available -- which would be counter to Project Zero principles. With just a few public clarifications and maybe tweaks, Qualys would be able to use the term "Qualys Project Zero" without violating the spirit behind the name. I'd be delighted at any such outcome: multiple Project Zeros, each funded by some benefactor with an interest in security, is one way to scale this thing. In my previous post on Yahoobleed #1 (YB1), we saw how an uninitialized memory vulnerability could lead to disclosure of private images belonging to other users. The resulting leaked memory bytes were subject to JPEG compression, which is not a problem for image theft, but is somewhat lacking if we wanted to steal memory content other than images. 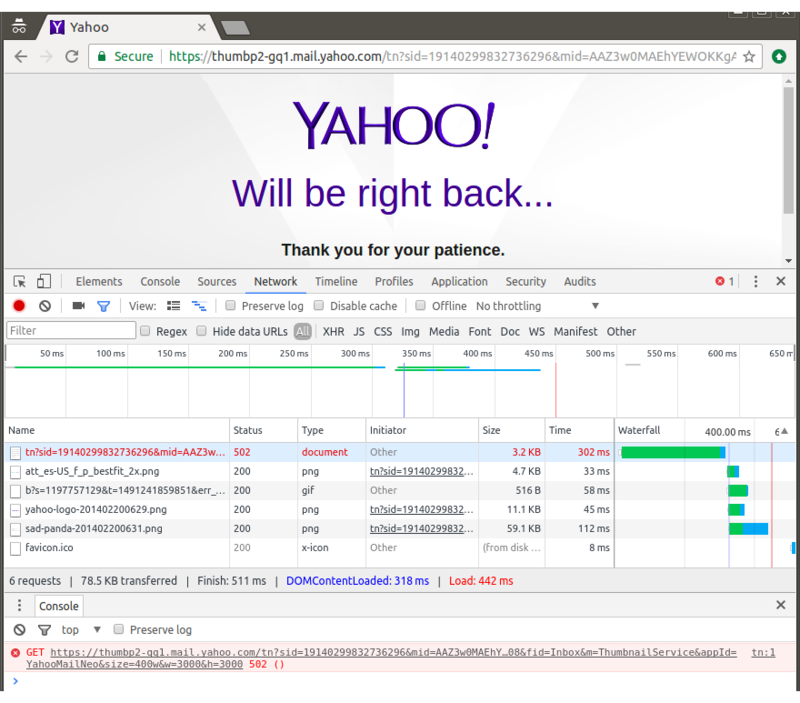 In this post, we explore an alternative *bleed class vulnerability in Yahoo! thumbnailing servers. Let's call it Yahoobleed #2 (YB2). We'll get around the (still present) JPEG compression issue to exfiltrate raw memory bytes. With subsequent usage of the elite cyberhacking tool "strings", we discover many wonders. Yahoo! fixed YB2 at the same time as YB1, by retiring ImageMagick. See my previous post for a more detailed list of why Yahoo! generally hit this out of the park with their response. The above patch of noise is a PNG (i.e lossless) and zoomed rendering of a 64x4 subsection of a JPEG image returned from Yahoo! servers when we trigger the vulnerability. Repeating similar structures with the same alignment (8 bytes on 64-bit). Again in blocks of pointers, vertical stripes of black next to that, representing 7 bits set in a row of the 0x7f value. And again in blocks of pointers, a thin vertical stripe of white next to that, representing the 1 bit not set in the 0x7f value. But we still see JPEG compression artifacts. Will that be a problem for precise byte-by-byte data exfiltration? We'll get to it later. The hunt for this vulnerability starts with the realization that we don't know if Yahoo! is running an uptodate ImageMagick or not. Given that we know Yahoo! supports the RLE format, perhaps we can use the same techniques outlined in my previous post about memory corruption in Box.com? Interestingly enough, the crash file doesn't seem to crash anything but all the test files do seem to render instead of failing cleanly as would be expected with an uptodate ImageMagick. After some pondering, the most likely explanation is that the Yahoo! ImageMagick is indeed old and vulnerable, but the different heap setup we learned out about with YB1 means that the out-of-bounds heap write test case has no effect due to alignment slop. To test this hypothesis, we make an out-of-bounds heap write RLE file that substantially overflows a smaller chunk (64 bytes, with a 16 byte or so overflow), and upload that to Yahoo! This looks like a very significant backend failure, and our best guess is a SIGSEGV due to the presence of the 2+ years old RLE memory corruption issue. Let's say we have width=256, height=256, depth=1, length=8. Image of depth 1 bypasses check of number_pixels against sun_info.length. sun_data is allocated to be a buffer of 8 bytes, and 8 bytes are read from the input file. Decode of 1 bit per pixel image proceeds. (256*256)/8 == 8192 bytes are required in sun_data but only 8 are present. Massive out-of-bounds read ensues; rendered image is based largely on out-of-bounds memory. The most interesting variable we can twiddle in this exploit file is the image data length. As long as we keep it smaller than (256 * 256) / 8, we'll get the out of bounds read. But where will this out of bounds read start? It will start from the end of the allocation of the image data. By changing the size of the image data, we may end up occupying different relative locations within the heap area (perhaps more towards the beginning or end with certain sizes). This flexibility gives us a greater chance of being able to read something interesting. Exfiltration is where the true usefulness of this exploit becomes apparent. As noted above in the vizualization section, the result of our exfiltration attempt is a JPEG compressed file. 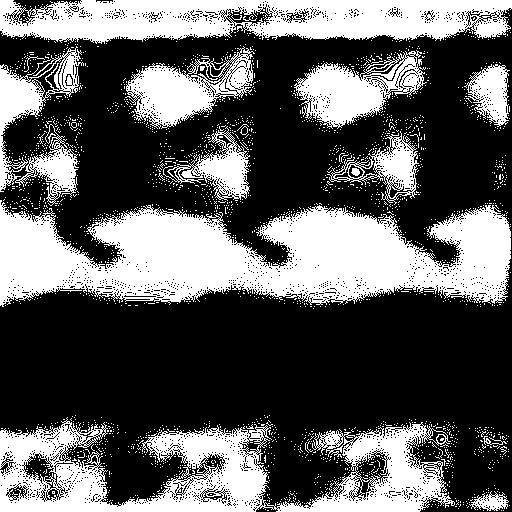 We actually get a greyscale JPEG image out of ImageMagick, since the 1 bit per pixel SUN file generates a black and white drawing. A greyscale JPEG is a good start for reliable exfiltration, because JPEG compression is designed to hack human perception. Human visualization is more sensitive to color brightness than it is to actual color, so color data is typically compressed more lossily than brightness data. (This is achieved via the YCbCr colorspace.) But with greyscale JPEGs there is only brightness. But looking at the exfiltrated JPEG image above, we still see JPEG compression artifacts. Are we doomed? Actually, no. Since our SUN image was chosen to be a 1 bit per pixel (black or white) image, then we only need to preserve 1 bit of accurate entropy per pixel in the exfiltrated JPEG file! Although some of the white pixels are a little bit light grey instead of fully white, and some of the black pixels are a little bit dark grey instead of fully black, each pixel is still very close to black or white. I don't have a mathematical proof of course, but it appears that for the level of JPEG compression used by the Yahoo! servers, every pixel has its 1 bit of entropy intact. The most deviant pixels from white still appear to be about 85% white (i.e. very light grey) whereas the threshold for information loss would of course be 50% or below. Those pointers, 0x00007f839b75f0d0 and 0x00007f839b763350, look spot on. Yeah, it's looking pretty serious. Obviously, these strings made for a much more convincing bug report. Also note the PerlMagick reference. I'm not familiar with PerlMagick but perhaps PerlMagick leads to an in-process ImageMagick, which is why our out-of-bounds image data reads can read so much interesting stuff. This was fun. We found a leak that encoded only a small amount of data per JPEG compressed pixel returned to us, allowing us to reliably reconstruct original bytes of exfiltrated server memory. *bleed attacks are hot right now. Most notably, there's been Heartbleed and Cloudbleed. In both cases, out-of-bounds reads in server side code resulted in private server memory content being returned to clients. This leaked sensitive secrets from the server process' memory space, such as keys, tokens, cookies, etc. There was also a recent client-side bleed in Microsoft's image libraries, exposed through Internet Explorer. One of the reason *bleed attacks are interesting is that they are not affected by most sandboxing, and they are relatively easy to exploit. Presented here is Yahoobleed #1 (YB1), a way to slurp other users' private Yahoo! Mail image attachments from Yahoo servers. YB1 abuses an 0-day I found in the ImageMagick image processing software. This vulnerability is now a so-called 1-day, because I promptly reported it to upstream ImageMagick and provided a 1-line patch to resolve the issue, which landed here. You can refer to it as CESA-2017-0002. The previous *bleed vulnerabilities have typically been out-of-bounds reads, but this one is the use of uninitialized memory. An uninitialized image decode buffer is used as the basis for an image rendered back to the client. This leaks server side memory. This type of vulnerability is fairly stealthy compared to an out-of-bounds read because the server will never crash. However, the leaked secrets will be limited to those present in freed heap chunks. They have a bug bounty program, which encourages and rewards security research and fosters positive hacker relations, etc. Upon receiveing a bug, they serve a 90-day response deadline on themselves. This is very progressive and the polar opposite of e.g. Microsoft, who occasionally like to turn reasonable disclosure deadlines into a pointless fight. And indeed the bug was fixed well within 90 days. The communication was excellent, even when I was sending far too many ping requests. The fix was particularly thorough: ImageMagick was retired. A robust bounty of $14,000 was issued (for this combined with a similar issue, to be documented separately). $778 per byte -- lol! I'm donating this reward to charity. Upon being asked about charitable matching, Yahoo! accepted a suggestion to match (i.e. double) the reward to $28,000. The attack vector for these demos was to attach the 18-byte exploit file (or a variant) as a Yahoo! Mail attachment, send it to myself, and then click on the image in the received mail to launch the image preview pane. The resulting JPEG image served to my browser is based on uninitialized, or previously freed, memory content. The following three images have had entropy stripped from them via a variety of transforms. Originals have been destroyed. In image #1, you can see the capital letter A inside a black circle. Imagine suddenly and unexpectedly seeing this in a returned image while investigating a vulnerability you expected to be boring! There are various possible reasons for the repeated nature of the recovered image -- assuming the original in-memory image does not consist of a repeated nature. Most obviously, the in-memory image dimensions probably don't match the dimensions of our uninitialized canvas, 1024x1024 in this particular case. Depending on how the in-memory image is stored, this will lead to repetition and / or offsetting as both seen here. Also, the in-memory image representation might not match the colorspace, colorspace channel order or alpha channel status (yes or no) of the uninitialized RLE decode canvas. The thumbnail decode and re-encode pipeline will leave all sorts of different in memory artifacts in the course of doing its job. Don't be in any doubt though: correct reconstruction of the original image would be possible, but that's a non-goal. In image #2, you might still be able to make out the remains of a human face. Perhaps a forehead, perhaps a nose and even a forehead and cheekbone? Or maybe not, because of the stripping of entropy and transforms applied. But you can appreciate that at the time, seeing a random face was a shock and illustrated the severity of the leak. At that point, I ceased, desisted, destroyed all files based on uninitialized memory and reported the bug. In image #3, the color has been left in because the image shows interesting vertical bands of magenta, cyan and yellow. What in-memory structure leads to this pattern? I have no idea. At first I was thinking some CMYK colorspace representation but I don't think that makes sense. JPEGs are typically coded in the YCbCr colorspace, so perhaps a partially encoded or decoded JPEG is involved. Allocate a suitably sized canvas for the image decode. Note that the GetVirtualMemoryBlob call does NOT guarantee zero-filled memory, as you would expect if it were backed by mmap(). It's just backed by malloc(). Depending on some image header flags, either initialize the canvas to a background color, or don't. Iterate a loop of RLE protocol commands, which may be long or may be empty. After this code snippet, the decoded canvas is handed back to the ImageMagick pipeline for whatever processing is underway. As you can now see, the attacker could simply create an RLE image that has header flags that do not request canvas initialization, followed by an empty list of RLE protocol commands. This will result in an uninitialized canvas being used as the result of the image decode. Here's an RLE file that accomplishes just that. It's just 18 bytes! 00 00 00 00: top, left at 0x0. There are a few bytes that are important for experimentation of exploitation: the number of planes (i.e. a choice between a greyscale vs. a color image), and the image dimensions, which determine the size of the unininitialized malloc() chunk. Decoder lockdown. Yahoo! did not appear to implement any form of whitelisting for only sane ImageMagick decoders. RLE is not a sane decoder on the modern web. Anyone using ImageMagick really needs to lock down the decoder list to just the ones needed. Sandboxing. As noted above, sandboxing doesn't have much of an effect on this vulnerability type. Although it doesn't make much difference, my best guess is that the server in question might be using Perl and PerlMagick, as well as handling various network traffic, suggesting that a tight sandbox policy is difficult without extensive refactoring. Process isolation. This is critical. *bleed bugs for most usages of ImageMagick are mostly harmless because it's typical to kick off e.g. a thumbnail request by launching the ImageMagick convert binary, once per thumbnail request. This means that the process memory space of the exploited process is only likely to contain the attacker's image data, making exploitation much less interesting (but not irrelevant as we saw in my recent Box and DropBox blog posts). The Yahoo! Mail process which is handling thumbnailing has an unusual property, though: it appears to be long lived and to process images from a variety of different users. Suddenly, a memory content leak is a very serious vulnerability. Heap implementation. The heap implementation used is significant. For the input RLE file decomposed above, the canvas allocation is 1024 x 1024 x 4, or 4MB. This is large allocation and for example, the default malloc() tuning on Linux x86_64 leads to such a large allocation being satisfied by mmap(), which zero-fills memory and will not lead to interesting memory content leakage! However, we definitely see leaked heap content with such a large allocation in the Yahoo! context, so a non-default heap setup is clearly in use. With our ability to leak heap content, we could likely fingerprint the exact heap implementation if we cared to do so. Who knows, maybe we'd find tcmalloc or jemalloc, both popular allocators with large service providers. Thumbnail dimensions. It's worth a brief note on thumbnail dimensions. If we're in a situation where our uninitialized canvas gets resized down to a smaller thumbnail, this would compress out detail from the original leaked memory content. This would spoil certain exploitation attempts. However, Yahoo! Mail's preview panel seems to display very large images (tested to 2048x2048) verbatim, so no worries here. Thumbnail compression. This one is interesting. Yahoo! Mail returns thumbnails and image previews as JPEG images. As we know, JPEG compression is lossy. This is not a particular issue if we're only interested in pulling image data out of Yahoo! servers. But if we're interested in looking at raw bytes of Yahoo! server memory, then lossy compression is losing us data. As an example of this, I tried to extract concrete pointer values from memory dumps -- perhaps we want to remotely defeat ASLR? I used greyscale images because JPEG compresses color data more than it compresses intensity data. But still, with a 16-byte sized data exfiltration I see pointer values such as 0x020081c5b0be476f and 0x00027c661ac2722a. Hmm. You can see that these may be trying to be Linux x86_64 user space pointers (0x00007f....) but there's a lot of information loss there. I think it would be possible to overcome this exfiltration problem. Most likely, there's some thumbnailing endpoint that returns (or can be asked to return with some URL parameter) lossless PNG images, which would do the trick. Or for the brave, mathematical modelling of JPEG compression?? Broadly: in a world of decreasing memory corruption and increasing sandboxing, *bleed bugs provide a compelling option for easily stealing information from servers. On design: taking a long running process and linking in ImageMagick as a library has to be a discouraged design choice, as it takes bugs that might not be very serious and makes them very serious indeed. Limiting ImageMagick decoders to a minimal required set is a must for any processing of untrusted input. GraphicsMagick vs. ImageMagick, again. Well, well, look at this :) GraphicsMagick fixed this issue in March 2016, for the v1.3.24 release, tucked away in a changeset titled "Fix SourceForge bug #371 "out-of-bounds read in coders/rle.c:633:39" (see the second memset()). This is another case where tons of vulnerabilities are being found and fixed in both GraphicsMagick and ImageMagick with little co-ordination. This seems like a waste of effort and a risk of 0-day (or is it 1-day?) exposure. It goes both ways: the RLE memory corruption I referenced in my previous blog post was only fixed in GraphicsMagick in March 2016, having been previously fixed in ImageMagick in Dec 2014. But most significantly for this conclusion, I wanted to highlight some questions about ecosystem responsibility. Researcher responsibility: what is a researcher's responsibility and where does it end? As a researcher who becomes aware of a software risk, I believe I have a responsibility to let the "owner" of that software immediately know about the issue and the fact that I think it's a security risk. Let's assume that the owner makes a fix in a reasonable time. Are we good now? Well, what about all the downstream usages (eventually cascading to end users) that don't yet have the fix? So is it my responsibility to go and find and harangue every cloud provider that is affected? No, probably not. We might let one or two providers with bounty programs know as a positive feedback for encouraging security research, but the broader problem remains. Upstream vendor responsibility: how should the upstream vendor respond to a security report other than identifying it (if not already clearly flagged) and fixing it promptly? Personally, I think there should be some form of notification in a well defined place (mailing list; web site announcement area; etc.) and the upstream vendor could also take the burden of getting the CVE. As part of warming up to write the exploit, I created a few sample test C files which explored different interesting glibc malloc() side effects after an off-by-one NUL byte write. You can find them here. The exploit abused a situation similar to consolidate_forward.c, but did not thoroughly need to defeat ASLR because the target platform was 32-bit. I also noted a curiosity for future research in shrink_free_hole_alloc_overlap_consolidate_backward.c: there's a possible sequence triggered by a NUL byte overwrite whereby ASLR can be cleanly defeated to leave aliased heap chunks. The C file is commented if you want to see how the sequence works. Interestingly enough, this technique turned up in a December 2016 Project Zero guest post describing a Chrome OS exploit chain. In a fantastic piece of work, attributed anonymously, a single byte overflow of the value \x01 is used to fully defeat ASLR and eventually achieve code execution in a 64-bit x86_64 process. I've been thinking about ways to kill this technique for a while now: it's far too powerful if it can reliably defeat ASLR in a 64-bit process. I also worry that many of the super serious Linux daemon bugs remaining are likely to be of the subtle type, i.e. one byte overflows. It's time for a brief foray into memory allocator design. glibc malloc. glibc malloc is based on dlmalloc, which has an inline metadata design. Specifically, every buffer handed out to the program is preceded by a little piece of metadata indicating the size of the chunk and whether the previous chunk is free or not. tcmalloc. tcmalloc is an allocator that has a largely out-of-line metadata design, on account of being a bucketing allocator for smaller sizes and a page based allocator for larger sizes. However, the internal metadata for this allocator is mixed in with pages handed out as buffers to the calling program. This was hardened a while ago by Justin Schuh for the Google Chrome web browser; not sure it made it upstream. PartitionAlloc. PartitionAlloc, part of the Google Chrome web browser. It has an out-of-line metadata design such that heap metadata is partitioned or guard paged off from the calling program's buffers. The notable exception, shared with tcmalloc, is freelist pointers, which occupy the freed slots. In PartitionAlloc, freelist pointers are transformed so that dereferencing them faults, and partial pointer overwrites are thwarted. While writing PartitionAlloc, strictly protected heap metadata was a goal. After all, if the metadata is naturally guarded with guard pages then there's less need for code defenses which are trying to detect and stop bad side effects from metadata corruption. Simplicity wins. However, there's an interesting interaction with single byte overflows that provides pause for thought and philosophizing. With an out-of-line metadata design, a single byte overflow off the end of a chunk will hit the first byte of some other chunk. Depending on the different object types that could be in the adjacent chunk, that's potentially a lot of possibilities for the attacker to explore. With an inline metadata design, a single byte overflow off the end of a chunk will hit some metadata. Depending on the level of metadata corruption checks present, the single byte overflow could be dead in the water as an attacker primitive. However, on the flipside, there's also the possibility for more generic attacks against the metadata, such as the one we are patching up here. This is one of those cases where a relatively simple patch pops out, but only after some careful thought and analysis. Freelist pointers. These are doubly linked and the double linkage is already validated. Since pointer values are a "secret" before ASLR is defeated, the attacker cannot fake pointer values before they have defeated ASLR. Lengths. There is also length linkage. For a free chunk, the length is present at both the beginning and the end of the chunk, to enable chunk traversal. Unfortunately, an attacker can craft a fake length easily and problems arise specifically when these lengths are modified to point to valid metadata structures, but not the "correct" metadata structure. Previously there was no length linkage validation. Now, if the attacker has an off-by-one corruption with a small value (NUL or \x01 - \x07) that hits the lowest significant byte of a length (malloc_chunk->size), the attacker can only use that to cause the length to effectively shrink. This is because all heap chunks are at least 8 bytes under the covers. Shrinking a chunk's length means it will never match the prev_size stored at the end of that chunk. Even if the attacker deploys their one byte overflow multiple times, this new check should always catch them. If an attacker has an arbitrary linear overwrite, they could corrupt both size and prev_size to match, but with that powerful primitive, there would likely be other more fruitful ways forward. Did we finally nail off-by-one NUL byte overwrites in the glibc heap? Only time will tell! Are we doing memory corruption mitigations wrong? Before we get into it, let's start by stating that the progression of memory corruption mitigations over the years has been intensely valuable. The progression of mitigations continues to make exploiting bugs harder and more time consuming. The pool of people who have both the skill and commitment to exploit any given bug (either reliably or at all) is shrinking. ASLR (address space layout randomization). Control flow integrity (Microsoft CFG, Clang CFI). The items in the above list have this in common: they target the side effects of memory corruption, as opposed to the memory corruption itself. Some of the side effects targeted are close to the time of the memory corruption, such as a stack canary being checked when a function that caused the corruption returns. Other side effects targeted are potentially very far from the time of the memory corruption, such as control flow integrity on a virtual call, after the attacker has read and written memory arbitrarily. When targeting side effects of a problem, as opposed to the problem itself, it's often hard to prevent the problem. I started working on this problem but unfortunately have to put it aside due to other commitments at this time. This blog post documents my thoughts and notes for anyone interested in this problem space. Should we invest more time in technologies that attempt to stop memory corruption in the first place? I think we should. It's certainly an under researched area. Let's first clarify that we're talking about defenses for existing C and C++ programs. There are plenty of essays advocating the replacement of C programs with those written in something safer, such as Go. This is a good longer term suggestion but in the shorter term, there's a whole boatload of C legacy that no-one is rushing to move away from. Modern compiler frameworks. A modern compiler framework such as LLVM allows security enhancement transforms to be applied before the optimization passes, so the compiler can lift security checks out of loops, etc. 64-bit processors. Newer processors tend to offer more registers and also "spare" bits in pointer values, both of which may lessen the performance impact of schemes previously tried on 32-bit. New processor instructions. As yet unexplored, but do processor extensions such as Intel MPX offer any paths to thorough yet high performance coverage? Rollback of mitigations. With a C runtime that does not permit buffer bounds to be exceeded, certain mitigations become redundant and can be rolled back. For example, if pointers are bounds checked, there's no urgent need for stack canary checking (which cost a percent or two), because it becomes hard to get the return address corrupted. Likewise for heap metadata hardening and possibly CFI (which also cost a percent or two). Faster heap implementation. Some of the ideas below rely on fast mapping of pointers to heap chunk metadata, such as is done in partitionAlloc() in Chrome. It just so happens that partitionAlloc is faster than almost anything else (including tcmalloc and certainly glibc malloc), so some performance could be clawed back here. In the quest for safer compiled C / C++, we might consider placing stricter requirements on the program. For example, while it's already undefined behavior to create certain out-of-bounds pointers, we could compile to a stricter variant of this. Or, if we decide to dabble in reference counting, it could be mandatory to NULL out all pointer references to a chunk before calling free(). Reserving the top unused bits of 64-bit pointers might also be useful. This first scheme illustrates how there are some low hanging fruits with a moderate impact and trivial performance overhead. Imagine if memcpy() overflow from one heap chunk to another would be a thing of the past? It fairly trivially can. partitionAlloc() currently couldn't provide a working partitionAllocGetPtrDetails() for arbitrary middle-of-chunk pointers inside allocations greater than about 1MB or so. This would need to be fixed, which might require a rejig of where metadata is stored, to be more ASAN-like. You'd need to stop the compiler thinking it knows all about memcpy() and inlining memcpy() for small fixed size values. This scheme will crash horribly if a stack, BSS or other non-heap pointer value is passed to memcpy(). A generic method of mapping arbitrary pointers to memory metadata needs to be extended to all pointers -- or the checks need to only fire for heap locations. This scheme won't protect for intra-chunk overflows, e.g. if the memcpy() destination is a buffer within a heap allocated struct, and the struct contains sensitive data after the buffer. Perhaps a candidate here for compiler struct re-ordering? But back to awesomeness, note that memcpy() is just a simple loop that iterates memory so you can imagine adding compiler support to decorate more complicated loops with high performance bounds checks. We can make the observation that a lot of existing memory checker tools perform checks on every pointer dereference (e.g. ASAN). However, the time when a pointer goes from "good" to "bad" is often when pointer arithmetic is applied to a pointer, such as bumping a pointer along at the end of a loop. Given that pointer arithmetic is a little less common that pointer dereference, would it be higher performance to instead do checks when a pointer is incremented to see if it crosses a chunk boundary? As a bonus, this would provide stronger guarantees than the ASAN model because in the ASAN world, e.g. *(ptr + 70) might not fault if that jumps over a redzone. At malloc() time, a random 16 bit cookie is assigned to the heap chunk and stored as metadata associated with the chunk. The returned pointer has the cookie value as the upper 16 bits. Copying a pointer around, or doing pointer arithmetic, proceeds at full speed and preserves the upper 16 bits. Dereferencing a pointer requires masking off the upper 16 bits and comparing them to the cookie value associated with the referenced heap chunk. As an optimization, the cookie value only needs to be re-checked if free() has been called, or a function is called that might call free(). So tight loops proceed with only the one check up front. When a heap chunk is freed, the cookie value is cleared. The cookie values for existing pointers into the chunk will not match while the chunk is free, and also will not match if the chunk is reallocated. I'm sure there are cleverer people than me out there who can propose better schemes. My point is that we need to try, because there are a ton of little tricks we can pull in this space to make some defenses that are both meaningful and fast. I really think we can stop memory corruption at the source for some vulnerability classes. There's going to be a performance hit but we can claw some of it back by retiring existing mitigations as they become less relevant. And is there any reason not to burn a couple years of Moore's law to kill off some memory corruption classes, instead of repeatedly trying to patch up their symptoms? In my previous post, we explored using an ImageMagick 0day (now a 1day) in the RLE decoder to to determine missing ASLR in both box.com and dropbox.com. In response, both Box and DropBox sensibly limited the available decoders. Both dropped RLE support and lots more. As you may recall from a different but related post, I had challenges working with Box to accurately determine the status of security reports I submitted. In fact, I have neither a confirmation nor denial of the missing ASLR issue on ImageMagick. I've already proven the missing ASLR to my satisfaction in the previous posts -- but is it fixed? This is a fairly ridiculous length to go to, but: let's prove that Box did fix the ASLR issue, by using another ImageMagick 0day! The above code snippet is reading in a PSD image color channel from the input file, where it is compressed using ZIP compression. The compact_size variable comes nearly directly from the input file, and it represents the size in bytes of the compressed zip stream. This size is used to allocate a malloc()'ed buffer to hold the compressed data, and the buffer is filled with a read from the input stream. The vulnerability is that there is no return value checking for the ReadBlob() call. This means that if the input file hits an end-of-file condition during the read, the compact_pixels buffer will remain partially or even fully uninitialized. You can refer to this vulnerability as CESA-2017-0003. It really is an 0day: unreported or unfixed upstream, let alone in Linux distributions or on cloud providers. The previous ImageMagick bugs I've been exploiting have been relatively simple to exploit because raw bytes of memory end up directly in the decoded canvas. With this vulnerability, however, the raw bytes of memory are in a buffer which is to be decoded as a zlib stream. Obviously, many possible sequences of bytes will not be valid zlib streams. And sequences of bytes that are valid zlib streams will likely result in output that is hard (or impossible) to reverse back to the original raw memory bytes. Finally, note that zlib streams are checksummed, and quasi-random bytes in memory are unlikely to have a correct trailing checksum. Here's the sample PSD exploit file: zip_uninit_read_128.psd. I won't break this one down byte by byte because it's 133 bytes of file format glue to get to the ZIP attack surface. In the above hex dump, all of the pointers are highlighted in green. All ten pointers are wholesome pointers indicating good ASLR, hence the green color. You can contrast this with some pointers in my previous post which clearly indicated that Box did not have ASLR on their binary. Proving a result with a negative (the lack of a clearly dubious pointer) is not particularly scientific, but I'll note that I tried a variety of different upload image sizes in order to explore the content of recently freed heap chunks of a variety of different sizes. I also tried the upload of some files multiple different times and never saw a pointer indicating a lack of binary ASLR. When binary ASLR was indeed absent, the same tests readily indicated the fact. The overall weight of evidence, split across two blog posts, suggests that Box did not previously have binary ASLR enabled, and they did indeed make a change and fix the issue after my report. We used an ImageMagick 0day (now 1day) to prove that ASLR was missing, and then a different ImageMagick 0day (still 0day today :) to prove that ASLR is now present. The loop is now satisfactorily closed.